This is an article that almost appeared on another photography website - maybe..
We've been reviewing various examples of the Phase One IQ180 cameras over the last months and although we've been happy with many things, there have been big problems with colour shifts when using wide angle lenses or with large camera movements. We've been approached by a UK photographer with an amazing technology. We've seen the Ricoh GXR camera but the new technology takes things a step further. The designers have approached the issue of high angle incidence colour shifts by making a sensor with almost 100% coverage and that has no need for microlenses. This means perfect colour from edge to edge even with the widest lenses and greatest shifts. And they haven't just produced one sensor, there is a range of different sensors which have pre-programmed ISOs. These sensors also have a new advantage in terms of dynamic range. Just like the Fuji EXR sensor, the new design combines pixels of different sensitivity and instead of two different sensitivities, it has three - low, medium and high iso sensor sites. This triple tonal range configuration has doubled the dynamic range of previous CMOS and CCD sensors.The sensor also uses a distribution of imaging sites that is aperiodic in nature which reduces anti-aliasing effects. Finally, just like the much acclaimed but overpriced Sigma Foveon design, the sensors for the different colours are distributed on top of each other in order to give full colour at any point on the sensor. The sensor is already adopted by the motion picture industry and is being used on many Billboard 100 films where absolute visual quality is important. No new technology is without its disadvantages however and this design is no exception - the sensor material itself is only a temporary 'cache' - the digital information is stored within the sensor and a separate device is used to extract it. This Photosite Extraction Device (PED) can produce files in any format you wish and we have been told that improved quality images can be extracted if a higher quality extraction device is invested in. The movie industry is using a high end PED which can extract 22Mp of 16 bit colour information from a full frame 35mm sensor (although Sigma would call this 66Mp of course!). We have been testing the new sensor in a different form, using a highly technical view camera which offers accurate tilts and shifts. The version of the sensor we have been using has an unbelievable 11,500 square millimetres surface area but with the disadvantage of needing a more advanced PED but this allows the production of >100Mp images in full 16 bit colour. We were most impressed by the screen on the back of our camera though. Being able to compose on a screen that is just under half the size of an A4 page and has a higher resolution that the new iPhone 4 is a joy, especially when using tilts where getting accurate focus can be particularly difficult. People are going to be asking about costs but contrary to expectations, the individual sensors in 35mm format can be had for 28p each! Obviously, the cost has been moved to the PED which can cost £10-20,000 pounds but there is at least one consumer version that can be had for just a few hundred pounds. There is also an in between, medium format sensor size that looks most attractive as it has the capability of >50Mp and can be used on old camera gear that takes the 120 film size. Unless your need is to take hundreds of photographs per week, this sensor makes complete sense. The cost per exposure is 80p which includes 3rd party photographic extraction. I think you may have worked out by now that I’m talking about good old film but let me carry on for a minute. I wasn't lying about the new bit, Kodak have released three new films in the last year, all using cutting edge technology that has taken hundreds of millions of dollars to develop. And you can buy a medium format camera for just over £100 with lenses that blow away nearly all DSLR lenses (and are usually less than £100 also). You’ve already got a digital camera and so having a film camera 'as well' has no downsides - you can still take all the digital pictures you want. So you can leave your film camera in the car and just give it a go when you've got some extra time. Pretty soon you'll have a film full of great shots which will make the 40p a shot cost a small price to pay for 50Mp quality. The marketing machine deployed by the digital camera manufacturers in an attempt to capture a virgin user base abandoned film just as it was reaching its ultimate quality. Most people who used film never got a chance to experience the best it could offer. It is only now, with digital post production, cheap scanning and inket printing that we can see just how good the stuff was. The movie industry knows a lot about film and digital and if you read interviews with directors and cinematographers you’ll find many of them singing the praises of film and preferring to use it where possible. .. and it's not just motion pictures that use film - you would think TV productions would make the most of digital but a lot of big TV shows still use film too. What I find amazing is that the 35mm movie stock is actually only half the size of a 35mm camera frame (24mm x 18mm). So that big screen experience that you get at the cinema is just half of 35mm camera that you can pick up off ebay for £10. For an example of what medium format film can produce, take a visit to an IMAX cinema. 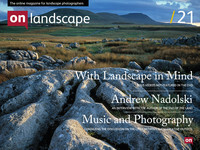 Now I thought twice about putting this article on Great British Landscapes because we're getting a bit of a reputation as anti-digital but I'm hoping more than anything that we can change that reputation to from anti-digital (which we try our best not to be) to film-friendly. All I want is for people not to think of film as some defunct, irrelevant medium that even old fogies have ditched but as the culmination of a century of photographic progress and a valid alternative or addition to anyones photographic arsenal.